Multi-award-winning illusionists, Markus & Angelique Steelgrave will add pizzazz to your event! From fully-staged magic shows including juggling, comedy, live animals and grand illusions; to less formal platform-style magic shows; to stunning close-up strolling magic for banquets or social hour--you select the best entertainment for your event, audience and budget. Venues include corporate events & promotions, resorts, festivals & fairs, post-graduation celebrations, schools & libraries, colleges, parties, theatres, and family functions. Friendly, flexible, fun, and highly-experienced (over 4,000 shows! 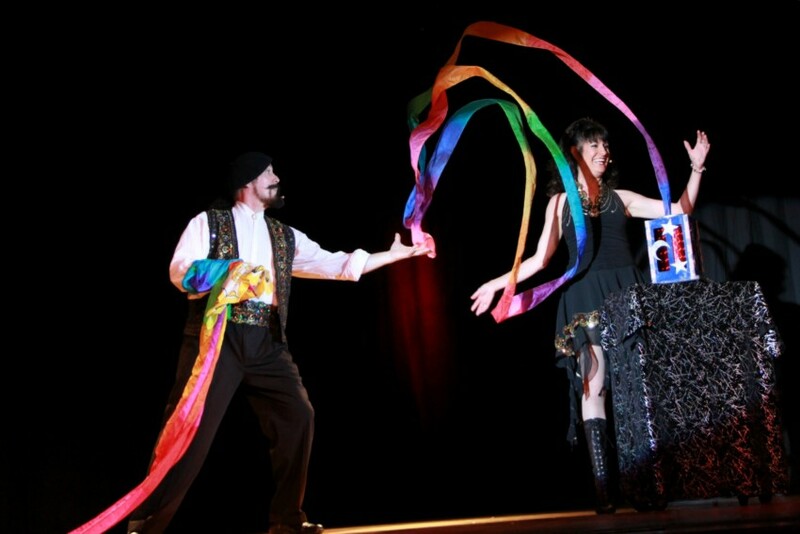 ), New England magicians Markus & Angelique Steelgrave will "bring the magic to you"! Stage shows are completely self-contained: The Steelgraves bring any needed backdrop, full sound system with microphones and music, additional stage lighting if necessary, and of course all equipment needed to create the magic. They arrive plenty of time before "show time" in order to check in, acquaint themselves with the venue, and load in equipment, to be ready to perform at the scheduled time. Performances can be as small as a 5' x 5' space in your home, up to completely full events utilizing the entire auditorium stage. Outdoor performances are possible, depending on the particular conditions. The Steelgraves work with you every step of the way, to maximize the efficiency and effectiveness of their performance at/for your event. If you have special needs, let them know--they can be accommodated in just about every case. A detailed Performance Agreement is always sent in advance, specific to your event, that outlines what you can expect, as well as listing their basic show requirements. There are no complicated Riders; everything is very straightforward and easy for you to accommodate. Generally, a 50% retainer fee is required, with the balance payable on the day of your event. They accept credit cards, and carry a general liability insurance policy. Once your event is booked and the retainer is paid, you are "set in stone", and all other requests for that date/time are turned down. 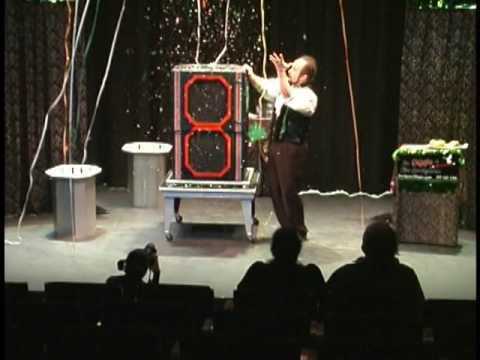 Whatever your event, your audience will LOVE the magic of The Steelgraves! STAGE PERFORMANCES: 20-90 minutes and include magic with live animals, clean comedy, juggling, and stunning visual illusions; larger shows also feature one to four "grand illusions". Shows are customized to suit your audience and venue. CLOSE-UP/STROLLING MAGIC is also a specialty; Markus will delight your guests one-on-one or in small groups. This type of entertainment puts the magic right into the hands of your spectators! It's perfect for banquets, hospitality suites, Project Graduations, corporate functions, company picnics, and social events/cocktail hours. BALLOON SCULPTURE is another option; and for every hour of balloon sculpture booked they also include TEMPORARY TATTOOS if desired, at no extra charge. The Steelgraves were the co-creators and Entertainment Coordinators of the Cape Cod Festival of Magic, and produce a convention for magicians, the Oceanside Magic International convention on Cape Cod. They work closely with their peers in the field of magic, as well as the rest of the planning committee, to make these events happen. This means The Steelgraves are sensitive and responsive to the needs of event planners. This duo is super easy to work with; they don't have a long list of demands; fees are reasonable; they can be counted on not to cancel your show for a "higher paying gig"; they don't "double book" and leave you in the lurch at the last minute; AND they can perform almost anywhere, depending on the show you select. Experienced, friendly, and adaptable, The Steelgraves will work with you to create the BEST entertainment for your event! The Steelgraves DO occasionally travel more than 200 miles from their Southern Maine location, but as all travel is by vehicle, mileage and travel times/fees will vary. For long distances, hotel accommodations are required (usually they simply add the hotel cost to their fee and arrange overnight accommodations themselves, so you don't have to). Block booking is encouraged to save on travel costs, and discounts are given for multiple performances by different organizations for the same or adjoining dates. The Steelgraves bring a backdrop that adjusts in height/size to fit your venue. This adds an elegant, theatrical touch to the performance and--in venues without a stage--clearly defines the "performing area". They also bring a sound system and basic stage lighting (if needed). Indoor performances are always best. Outdoor performances are possible, but please contact us to discuss the performing environment. An indoor location must be arranged in advance in the event of inclement weather; if your event is cancelled due to weather conditions and there is no alternate location, the contract is still "pay or play".